For many real estate agents, the industry’s move to digital marketing—from Zillow to Instagram to Nextdoor—has become a constant game of catch-up. There’s always something new to learn, another “latest-and-greatest platform” to try. 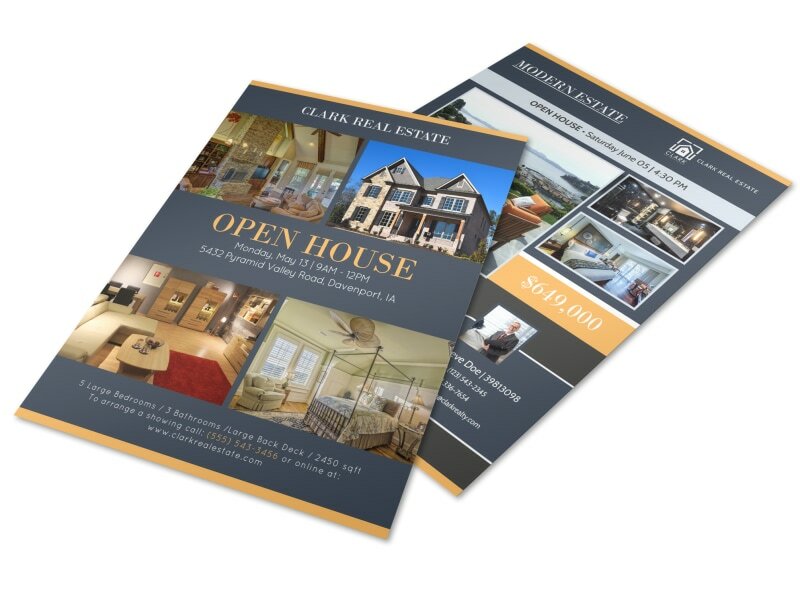 But you shouldn’t let your desire to keep up with the digital Joneses prevent you from utilizing one of the most tried-and-true approaches to real estate marketing: print. That’s right! Print is still one of the best tools in any real estate agent’s arsenal—especially when it comes to open houses. So let’s get started with the big picture first: a few general recommendations, or “golden rules,” for your real estate print marketing. 1. Power up your words. What if we told you that you that you could drastically improve your real estate marketing with just a few keystrokes? It may sound too good to be true, but this isn’t some get-rich-quick scheme! It’s based on comprehensive research by CoreLogic (who analyzed over 1 million home sales) and economist Paul Anglin (who surveyed more than 20,000 real estate ads). 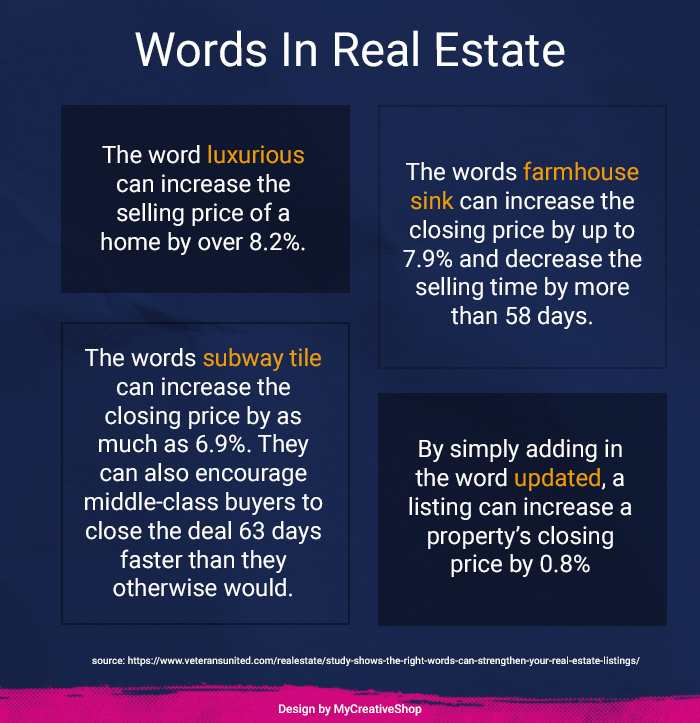 Incorporate these words into your open house marketing and listing materials to get that property moving fast! We’ve all heard that a picture is worth a thousand words, and nowhere is this more true than in real estate advertising. In fact, a study by VHS Studios found that homes with high-quality photos sold 32% faster! So be sure to have professional, high-resolution photos of the property’s interior and exterior, and always take more than you think you’ll need. They’ll come in handy for your open house postcards, single-page sell sheets, takeaway brochures, and more. 3. Build a professional brand. As a real estate agent, every interaction you have with clients, whether in person or through direct mail marketing, is a chance to build your brand. And it’s your personal brand that ultimately positions you as a trustworthy, friendly, and experienced local professional! 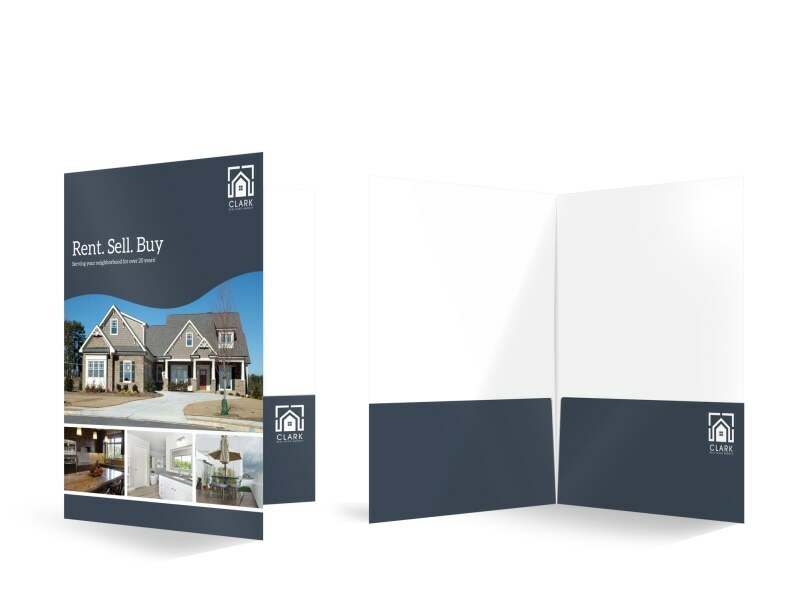 Fortunately, even if you aren’t a graphics or printing expert, there are tools available to create real estate marketing materials that are high-quality and on-brand. 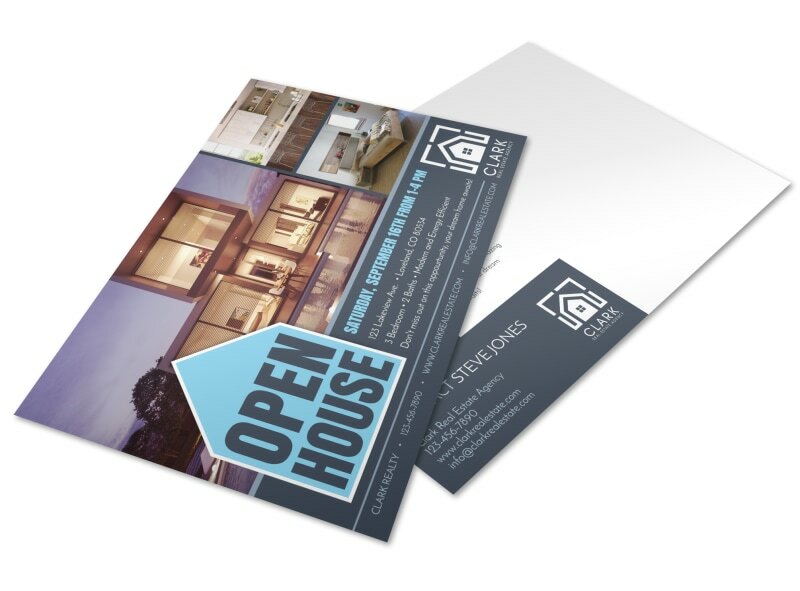 Here at MyCreativeShop, we have tons of real estate templates, from open house flyers to yard signs and EDDM postcards. Create your own design, print it with us or anywhere else. We make it easy! Effective real estate marketing connects properties for sale with potential buyers who are both willing and able to make an offer on that property. Everyone would like to have a 10-million dollar home… but advertising a luxury open house to a family that’s barely getting by certainly won’t make you many sales. To make sure your properties are being shown to the right target audience, it’s worthwhile to create detailed buyers’ personas—long before you even think about the font, colors, or headline for your postcard or flyer! Whether you’re creating a flyer to stir up excitement in the neighborhood or a postcard to say thank you to open house attendees, one aspect is absolutely crucial: clarity. All relevant information should be clearly presented and easy to read. At the very least, list the property address (without abbreviations like Rd, St, or N), the open house date and time, your logo and contact information, and a few high-quality photos and/or highlights of the property. Remember to use large, high-contrast fonts so that readers don’t have to squint to find out who you are or what you’re selling. 6. Combine print and digital. 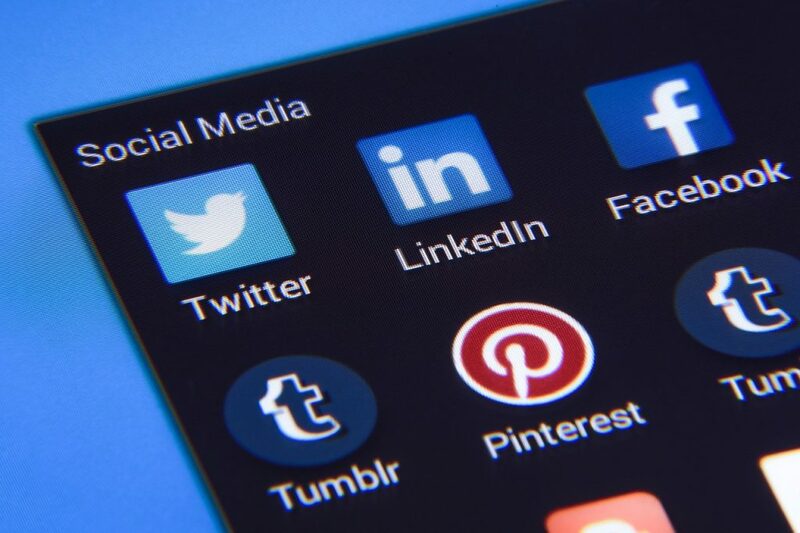 As we mentioned before, social media platforms, listing websites, and neighborhood interest groups have drastically changed how homes are listed, shown, found, and sold. But that doesn’t mean that you should skip print altogether; it just means that you should be tying your print and digital marketing together. Include your website, email address, and any social media profiles on all of your print materials. Use specific URLs or QR codes on all of your print materials so that you can track conversions. Announce new listings, open houses, and sold properties on social media as well as through direct mail marketing. Have attendees sign in via a real estate open house app that automatically enters them into your CRM or automated email marketing. Share photos of your open houses and other events on social media. Always remember that your clients are likely viewing your materials both online and offline, so every item you send or post should be consistent and on-brand. The six recommendations above may sound like a lot to take in…but once you’ve mastered them, you’ll have a solid foundation for all kinds of real estate marketing: postcards, flyers, social media, and more. So now that we’ve got the generals out of the way, let’s move into the specific print materials you need for a successful open house. You know that much more goes into a successful open house than just announcing it and waiting for people to walk through the door. 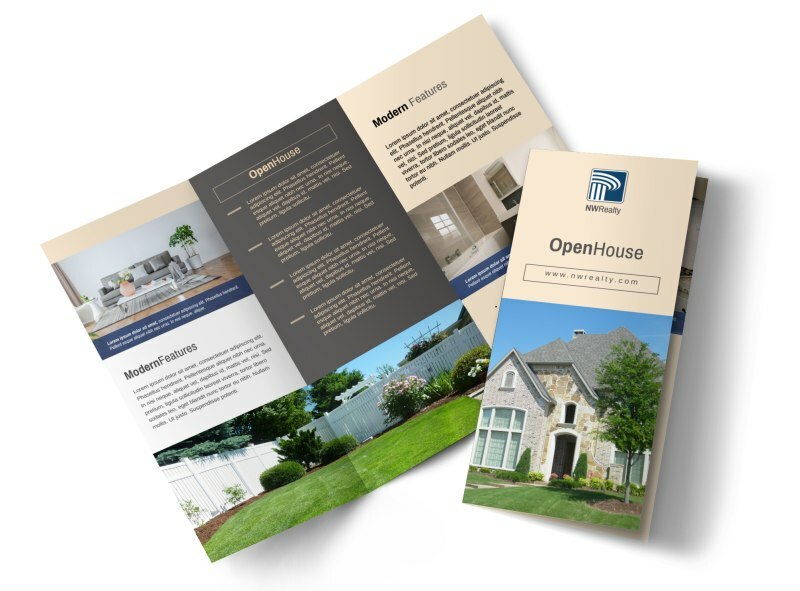 In the weeks and days leading up, make sure your open house is set up for success by effectively using print marketing to spread the word. Try out these four methods below! 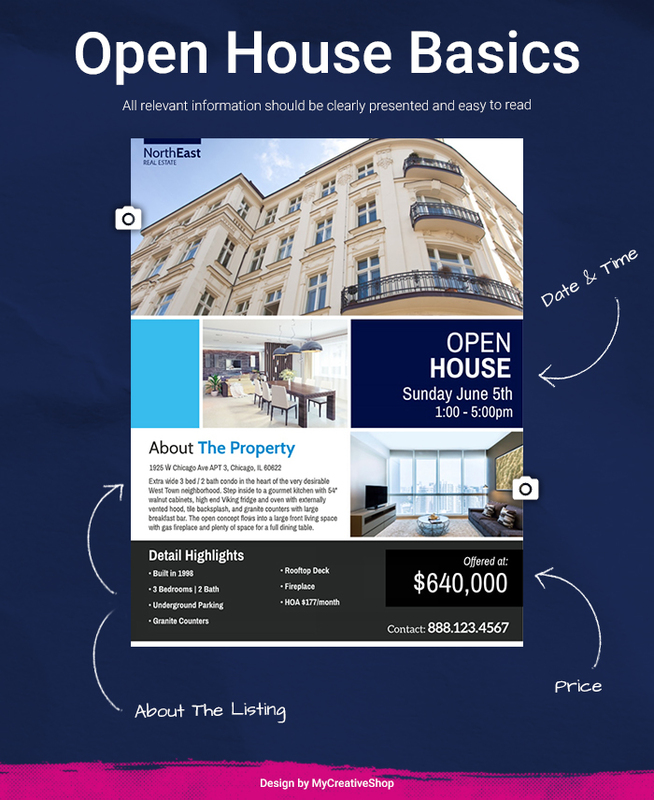 Flyers can be distributed hyper-locally within the neighborhood, on public bulletin boards throughout the community, or in your real estate agency’s window. If you have the budget, you can also run a version of your open house flyer in the local paper. 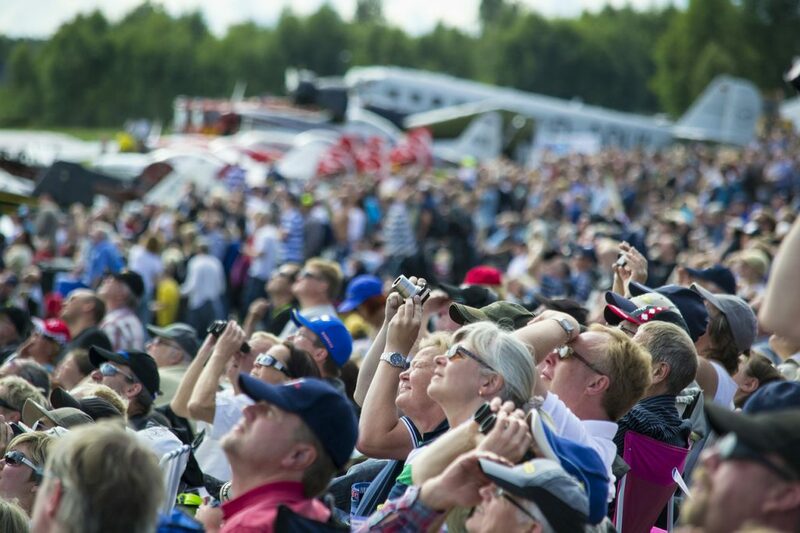 Extra tip: Generate a little more buzz by offering exclusive events and advertising them via flyer! For instance, you could host a special neighbors-only open house, offer a free seminar for first-time home buyers, or bundle several open houses in the same neighborhood into an exciting mega-event. Sending out direct mail postcards is a cost-effective way to target potential home buyers in your local community, especially if you use an automated service such as USPS Every Door Direct Mail (EDDM)®. 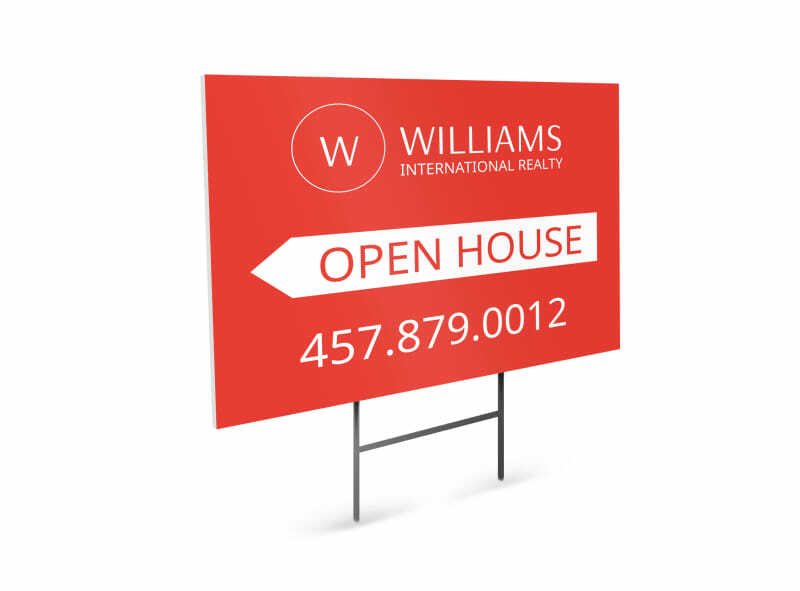 On your postcards, be sure to include all relevant information, including the property address, open house date and time, your contact information, and any special events (e.g. raffles, giveaways, or charitable donations) that will take place. 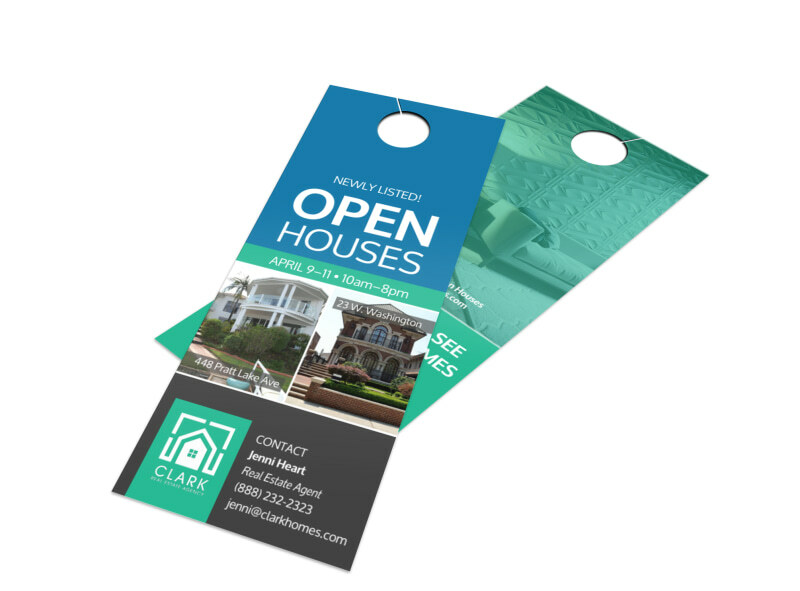 Door hangers are another effective tool for spreading awareness about an open house. Some people actually knock to share the news in person, but others find this method a little too intrusive. 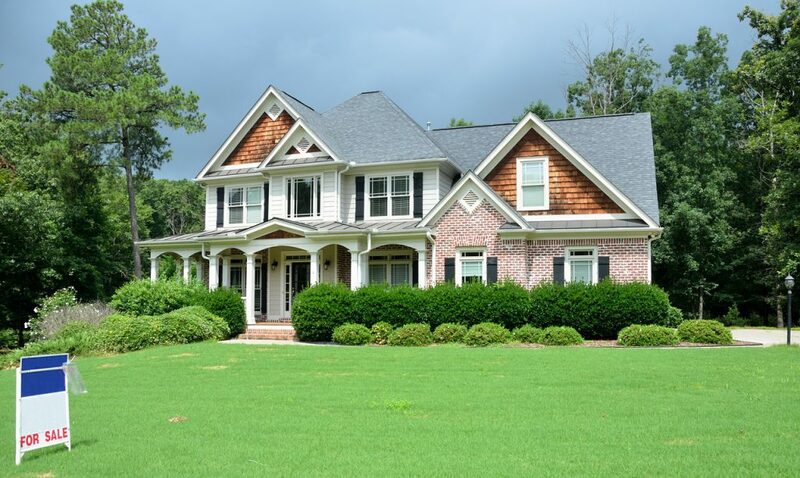 If you aren’t sure, ask your clients which would be most appropriate for their neighborhood. If you think yard signs are dead, think again! According to the National Association of Realtors (NAR) Home Buyer and Seller Generational Trends Report 2017, 49% of home buyers use yard signs as an informational source. Legibility is especially important for yard signs. As a rule of thumb, all yard signs should have high contrast and be readable from at least 30 feet away. Once you’ve actually brought guests to your open house, the work of selling the home has really just begun. Fortunately, informative, well-designed print materials can make that job much easier! With the right open house print materials, you’ll not only keep visitors occupied and interested while you’re running to and fro with hosting duties; you’ll also give them something to take home as a reminder of the open house. 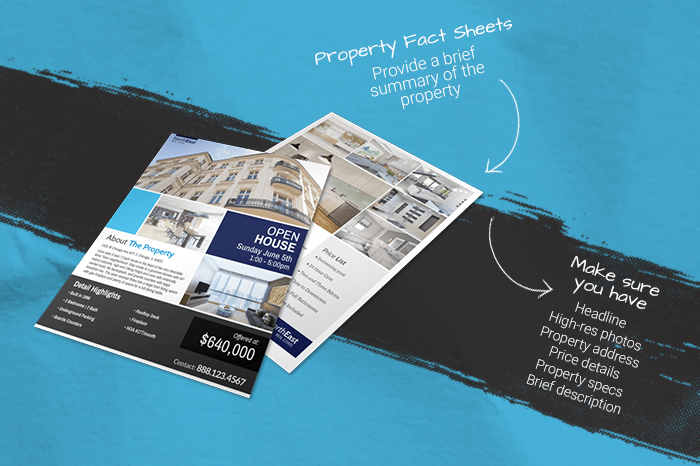 Property fact sheets go by a dozen different names: listing flyers, sell sheets, face sheets, hot sheets… But they all boil down to providing a brief summary of the property for sale. A bulleted list of essential information: square footage, beds, baths, etc. Remember to use some of those high-value power words we mentioned above! Every property should have a basic sell sheet, but you can make yourself stand out as a real estate agent by providing even more information. After all, most families care about more than just the house; they want to know whether they could see themselves at home in this space. The best thing about these open house handouts is that your guests can take them home afterwards! Better yet, bundle them into a professionally printed real estate folder complete with your business card and contact information. The best time to get feedback on your open house is as your guests leave. 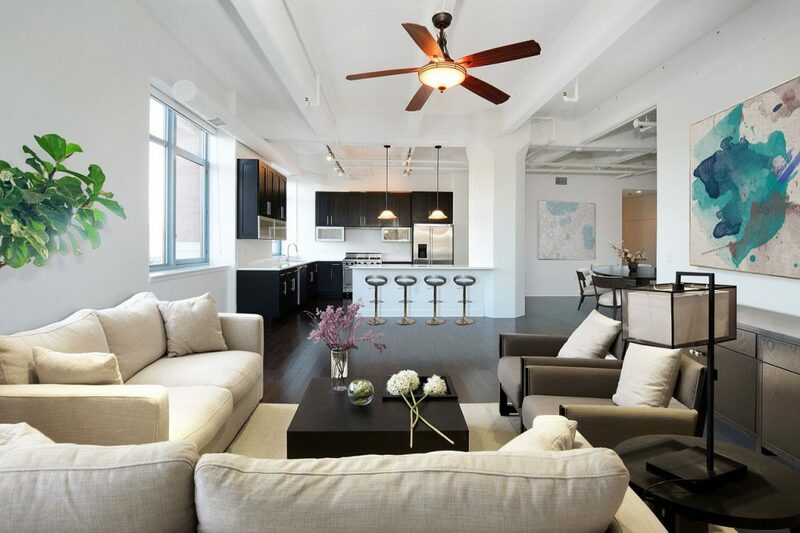 With a professionally branded feedback form at the door, you can leave a final good impression with viewers while also getting their honest opinion on the property. Include a call to action for them to contact you to discuss their feedback privately or to move forward with an offer. Once you’ve established rapport with guests at your open house, you can then use print materials to stay top-of-mind and maintain that relationship far into the future. Through direct mailing, you can even continue to target local homeowners who didn’t attend your open house. Just like the house you’re showing off, you only have one chance to make a good impression on the potential home buyers and sellers of your community. So set yourself apart from other local real estate agents with informative, well-branded, and professionally printed materials! Whether you’re door-hanging to advertise a new listing or greeting guests at your jam-packed open house, you’ll establish yourself as the go-to community professional. 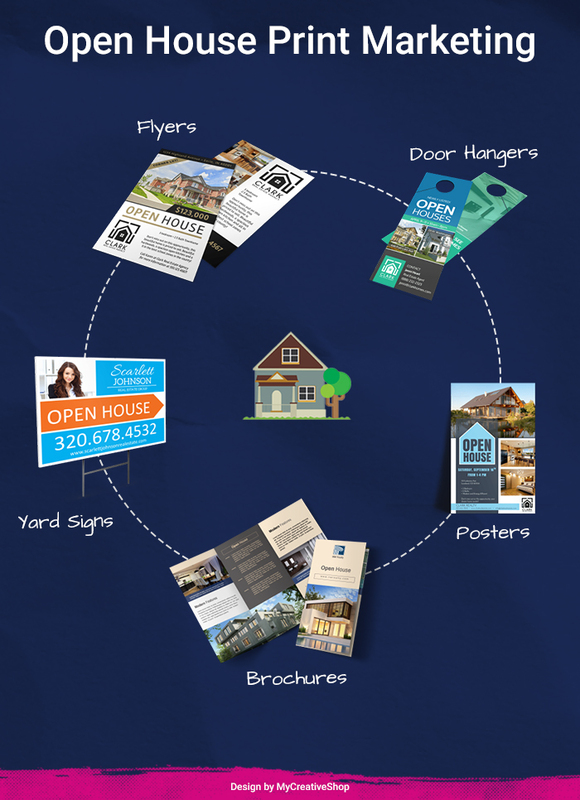 Need some help creating your open house flyers, property fact sheets, or other real estate marketing materials? MyCreativeShop has you covered! Try out our easy-to-use online editor and start building your real estate brand with customized design.